"The only place where one person talks at a time is a classroom," Ray quipped. Our kids were talking as the food was passed. Ray (step-dad/granddad) was working his way through a joke he was telling. When I commented on the distracted kids, Ray chuckled reassuringly, "That's okay. The only place where one person talks at a time is a classroom." I was momentarily stunned. I immediately thought of the professional relevance of the words. Ray's comment was totally in jest. But there is a sad element of truth to this, at least in many traditional classrooms. I could see that this statement was profound in a sense. As you might expect, often the one person who is doing most of the talking is the teacher. Students sit in desks, with materials out in front. They are slouched over, eyes tired but gazing toward the front of the room. That is where the teacher remains. 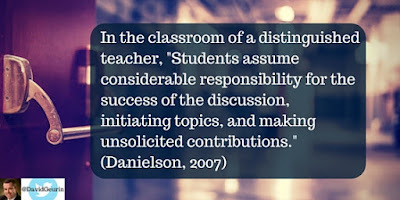 Even when students are invited to speak, it's a response to the teacher. Maybe a couple of words. Answering a question. Nothing that resembles an authentic conversation. On task? Yes, you could say so. Engaged. Not in the least. 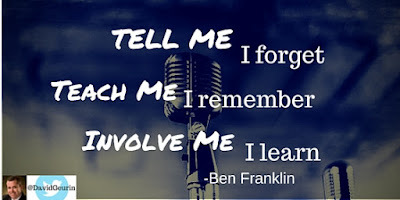 It's true that the one doing most of the talking is also doing most of the learning. Students have a lot to say, and the skilled teacher creates conditions for students to process what they are learning through conversations. Is your classroom characterized by too much teacher talk? Question: How do you ensure that student voice is developed? Leave a comment below or respond on Twitter or Facebook.